* With its interchangeable wire ends and aluminum handle, this tool is an ideal trimming and footing ceramic tool. * Sharp cutting edges fit securely while trimming and footing pots and bowls. * Approximate length - 8 1/2". 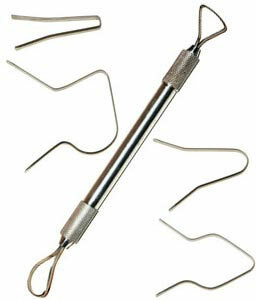 * The additional 4 wire ends are interchangeable and have sharp cutting edges. * They fit securely into the TrimFast handle.